>Yesterday at the Oracle SOA and E2.0 Partner Community Forum in Utrecht I had a good talk with Edwin, Guido and Eric about OSB and one of the topics was our experience with Xquery functions in the OSB. So I mentioned some examples I used in the past and decided to post them on my blog when I had the time. So here is one to start. First we declare a nice namespace for our function ‘library’ in the top of our XQuery file. Then we create our function, the following example is used for altering the format of Date and Time values to the specific format that Siebel expects. The code should be clear enough I hope with the comments in them. This is off course just one of the possible ways to do it and contains some specific environment checks I had to use. For instance this function was also used when the source is not XML but files (the old BEA MFL way of working) where day and month could have a value of 00 and we had to alter this to 01 as a business requirement. Due to the the fact that the input parameters are optional (the ? character after the declaration) you can leave the second input for time out or use ” as input. In this case we need to publish messages from the OSB 10.3.1 to Siebel 8.1.1.2 where Siebel supports different options for authentication of incoming HTTP webservice requests. And last but not least; Siebel claims to support the WS-Security UserName Token mechanism. However Siebel only supports the PasswordText option so the password will still be send in clear text. We concluded that the URL or the custom header option was not acceptable due to the customers security requirements. The only acceptable solution for them would be the WS-security UsernameToken. Within the OSB this can be arranged by using a WS-policy and a Service Account and connect them to the outgoing business service. Since the password will still be in cleartext, we will use SSL to protect the password on it’s journey over the dark trenches of our WAN. 1st the Siebel configuration for inbound services. Make sure the authentication type is set to username/password clear text. Attach the policy to the OSB business service together with the service account and go !!! Bummer, we get our 1st error. Well let’s say that good things always take some extra effort. The error might let you think that Siebel simply fails on the mustUnderstand attribute which would force it to understand the SOAP header. However this is not the whole case. After some debugging and using the Assign action in the OSB to manually build the SOAP-header with the WS-security definition it was possible to send out a UserName token Siebel accepted. 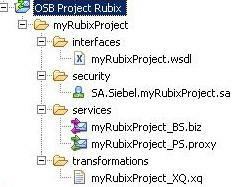 After this my conclusion is that Siebel apparently expects another wsse namespace then the OSB is generating. Siebel requires the old wsse IBM/Microsoft/VeriSign definition of “http://schemas.xmlsoap.org/ws/2002/04/secext&#8221; while the OSB uses the newer namespace “http://docs.oasis-open.org/wss/2004/01/oasis-200401-wss-wssecurity-secext-1.0.xsd&#8221; which was changed to match the OASIS specifications after their approval of WS-security as a standard in 2004. After contact with Oracle Support I received confirmation from the Siebel Team that this is a limitation from Siebel, as it is not accepting the latest WS-Security definition. The option they give you is that for now it’s the caller’s responsibility to change the header to conform to the namespace Siebel is expecting. We edit the Replace action to use the username and password elements. Don’t forget to add the con namespace to the Replace action.